Boschendal is a wine estate in the Dwars River valley just a few kilometres from Pniel. It is situated on the slopes of the Groot Drakenstein and Simonsberg mountain ranges towards the Dwars Rivier which flows past Pniel. The 254 hectare estate dates back to 1685 . The ownership of this estate makes interesting reading as the first owner was Jean le Long a French Huguenot. 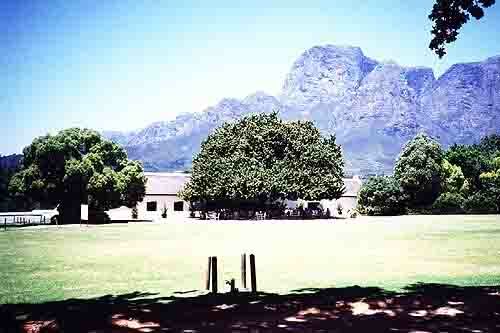 In 1715 the estate was bought by Abraham de Villiers who sold it to his brother Jacques in 1717. The farm remained in his family till 1879 when Cecil John Rhodes bought it along with 20 other farms in the area. Cecil John Rhodes the Governor of the Cape at the time established a company called Rhodes Fruit Farms to run the farms. When he died in 1902 the farms were managed by de Beers Mining company which also belonged to Rhodes. For forty years de Beers managed the farms and in 1969 Anglo-American Corporation took over the management. It was then decided to replant the vineyards and all the buildings on the farm were renovated. The vineyards extend for six kilometres along the mountain slopes and this allows for some interesting planting techniques. A number of grape varieties are grown on the estate and great care is taken to find the most appropriate location for each variety. Chardonnay and Sauvignon Blanc are the white varieties that are farmed and take up most of the estate although the red varieties of Cabernet Sauvignon, Merlot and Shiraz have also recently been extensively planted . This stands the estate in good stead as it can now produce excellent red and white wines. Anglo American over the past year or so, has sold off a large portion of the Boschendal land holdings comprising some of the original Founders estates, to the Boschendal property development company. They in turn intend developing a 300 unit retirement village and some 400 farmyard style villages on the sites of 30 existing farm villages which will in most cases be demolished. The good news is that the farming side of the operation of Boschendal Estates will continue. All in all the new developments in the Boschendal area could bring in R3.8 billion of new investment to the area and also establish a whole host of new jobs for the local labour force. This is good news as jobs are a scarce commodity in our country areas. For those who enjoy country drives the Boschendal estate caters for visitors. A number of restaurants and picnic areas have been established on the farm using the Manor House and the old slave quarter buildings. The buildings are in lovely settings surrounded by oak trees and vineyards as far as the eye can see. Next time you visit Cape Town visit the Boschendal estate and enjoy some of the fine wines you will find for sale there.